Very good location for visiting much of New Orlean, the included breakfast was always excellent, the rooms were comfortable, if a bit over the top 'shabby sheik', the bathrooms were old and could use an upgrade. The fountain in the courtyard, while nice, was loud as we were trying to sleep, as it was right outside our door. We loved our stay at Creole Gardens! It was such a unique and beautiful place! The staff was fantastic! Plus, the delicious breakfast in the mornings was something we looked forward to every day! We would definitely stay here again! Wonderful old mansion that has been turned into a quaint hotel. Our room was decorated as if it was the boudoir of a lady of the evening in old New Orleans. It just added to the experience of being in NO! We had a delightful stay. The kitchen and front desk staff are wonderful. Pleasant, helpful, professional. Breakfast was the best meal of the day and we looked forward to it. Beds and sheets were clean and very comfortable. Only complaint regarding the stay was the dirty floors in our room. Great location, trolleys a huge bonus. Like going to visit family. Inviting staff, great home cooked breakfast! Had a great stay..see you next year! The hotel is very nicely decorated: airy, colorful, with a lovely courtyard with a fountain. The music venue means you don't have to travel for entertainment, but they also end their evenings early so you can get some sleep. They provide a hot breakfast as well as many cold options, and the staff is warm and friendly. My room was pleasant and the bed was comfortable. It would have been nice to have an easy chair to sit in, but it was right for the price. Most relaxing place to stay in New Orleans. Very pet friendly, warm staff. Go see Queen Annie at the Road House on Friday evenings, next door. Great location. very enjoyable. breakfast was always a bit different and well prepared. rooms a bit small but quite manageable. outside courtyard pleasant to take a break and relax. Walking distance from just about anything, food, drinks, and shopping. Great people, loved staying there. Would definitely recommend and if I ever go back to New Orleans I will definitely stay there again. Great location, very cute and everyone was really friendly. The breakfast is amazing - simple southern style food. Thanks for the stay! Beautiful place and friendly staff! Very charming B&B. Staff was great at giving restaurant and activity suggestions. Free parking and made to order breakfast included. Awesome staff! If you want a treat, close to but not on Bourbon St, this is the place to stay. Definitely a jewel of a place! Was one of the only hotels with a reasonable rate, and I like the smaller bed and breakfast places with character. The staff were excellent and the room was good for the rates downtown at the time. Much of the room details and decorations were unique and historic - I loved it! Everything was clean. The bathroom was updated and mostly modern except for the shower/tub. 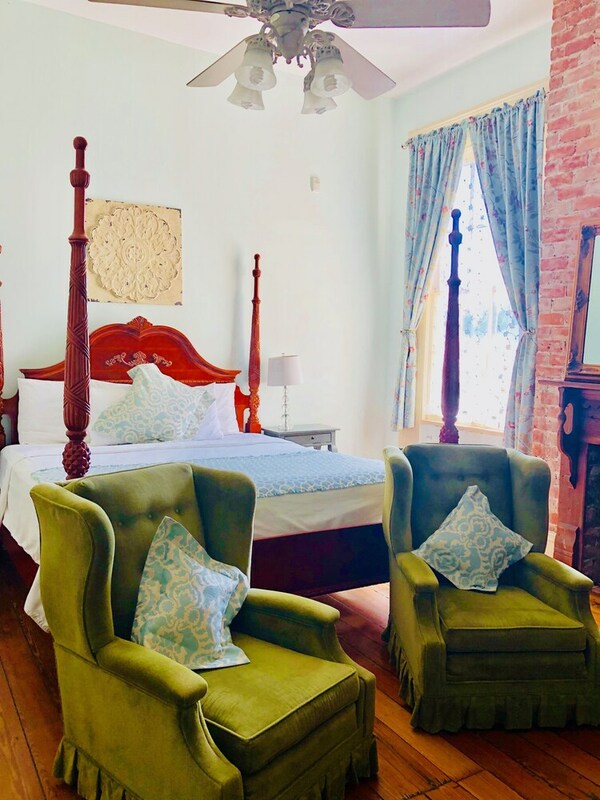 Located in Lower Garden District, Creole Gardens Guesthouse and Inn is within a 5-minute walk of Magazine Street and within 15 minutes of other popular attractions like National World War II Museum. This 3-star bed & breakfast has 24 guestrooms and offers conveniences like free breakfast, free in-room WiFi, and free self parking. Free cooked-to-order breakfast is offered each morning. An LCD TV comes with cable channels, and guests can stay connected with free WiFi. Beds sport premium bedding and the bathroom offers a hair dryer and free toiletries. Other standard amenities include a ceiling fan, an ironing board, and a desk. Guests of Creole Gardens Guesthouse and Inn enjoy access to free WiFi in public areas, a meeting room, and coffee in a common area. If you decide to drive, there's free parking. The front desk has multilingual staff that can help with tours/tickets and luggage storage. Additional amenities include a computer station, free newspapers, and a fireplace in the lobby. Thank you. Each room here is different. We're sorry yours was not to your liking. Please come again and choose another room (you can view them all on our website: creolegardens.com) that is not next to the fountain. Thank you, Ken . We appreciate the input and the great review. The wi-fi and TV we apologize for. Please come see us again. Thank you for a great review! Great to hear you enjoyed your visit here with us. Please come and see us again! Thank you for the great review/ We are happy you were pleased with your stay here with us. Please come and visit again. Thank you for your feedback! So happy you enjoyed your stay. Hope to see you again soon! close to public transportation and downtown. this place is at an excellent location! Free cooked-to-order breakfast is served daily. The preferred airport is New Orleans, LA (MSY-Louis Armstrong New Orleans Intl. ): 22-min drive, 15.3 mi/24.7 km. Guests with plans to arrive after 8 PM need to contact the property at least 24 hours prior to arrival using the information on the booking confirmation. Guests will receive an email with special check-in instructions prior to their arrival. For more details and to provide arrival time, please contact the property using the information on the reservation confirmation received after booking.